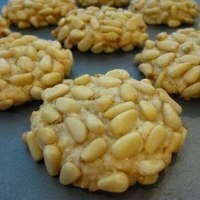 Alot of Pignolis (Pine Nuts) Can be quiten pricey. They MUST be shelled. Pre-Heat Overn to 350 degrees. Combine First 2 ingredients well togethr in a large mixing bowl. With wet hands rorm small balls and roll onto pignolis (Pine nuts- Untoasred. Place on either greased of non-greased cookie sheet about 2 inches apart, so they may seperate. They do expand. Another recipe I would like to try. Kids just love cookies and you have to have a different variety for them!